Disclaimer: The following bite is my perspective on tech investing; it is not an endorsement or a recommendation for investors to buy, sell or short any tech stock. 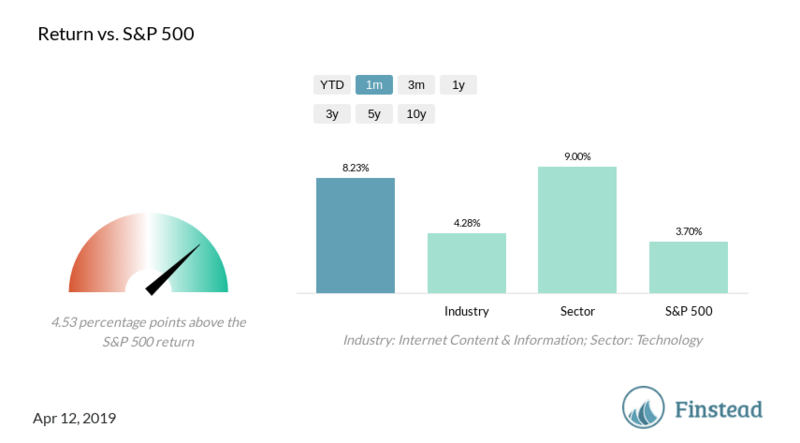 Technology is again up year-to-date in 2019 and outperformed the global equity market. There is some optimism that the U.S. and China can reach trade agreements and avoid a full-blown trade war, an issue that caused the markets and the tech sector to fall sharply in Q4'18. But now that the market is at the top of the 52-week range, where do you see opportunities for investing in the tech sector? Here are our bets. Please note that this is not a recommendation to buy these stocks--we're just giving you some ideas on tech stocks to investigate further. In the near term, margins will remain under pressure because of aggressive content spending and talent acquisition costs for AI personnel, but we foresee strong revenue growth for the company thereafter. Baidu (BIDU) is our internet pick. Although weaker economic growth in China is a concern, Baidu is the largest Internet search engine in China and has built an ecosystem around search and shifted to mobile. Baidu is now evolving from a mobile-first to an artificial-intelligence-first company. Over the last month, Baidu (BIDU) returned +8.23%. Baidu (BIDU) average analyst price target ($212.18) is 22.58% above its current price ($173.09). For the latest price and stock analysis of Baidu, please visit Finstead and ask for "Baidu" or "BIDU analysis". Applied Materials (AMAT) shares are trading at a discount. The company has benefited greatly from the sharp rise in spending by memory and display chipmakers over the past few years. 2019 is looking like a slower year for Applied; however, leveraging the breadth of its product portfolio and services, I believe Applied be able to navigate this softer demand. 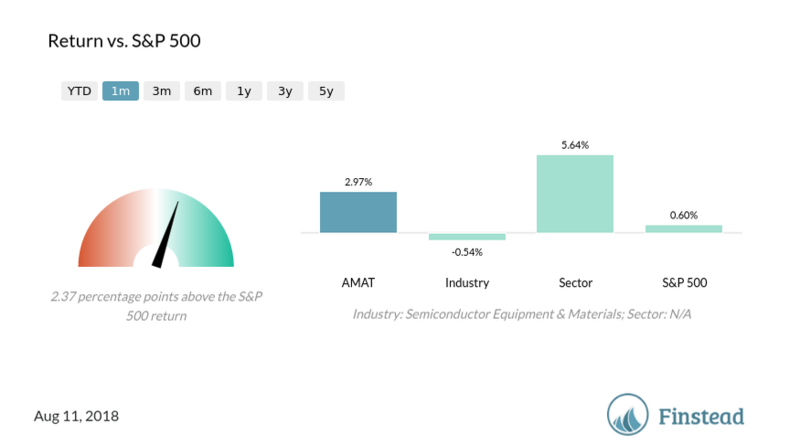 Over the last month, Applied Materials (AMAT) returned +10.56%. Applied Materials (AMAT) forward P/E ratio is 10.94, and it’s low compared to its industry peers’ P/E ratios. Applied Materials (AMAT) average analyst price target ($48.41) is 12.61% above its current price ($42.99). For the latest price and analysis of Applied Materials, visit Finstead and ask for "Applied Materials" or "AMAT analysis". 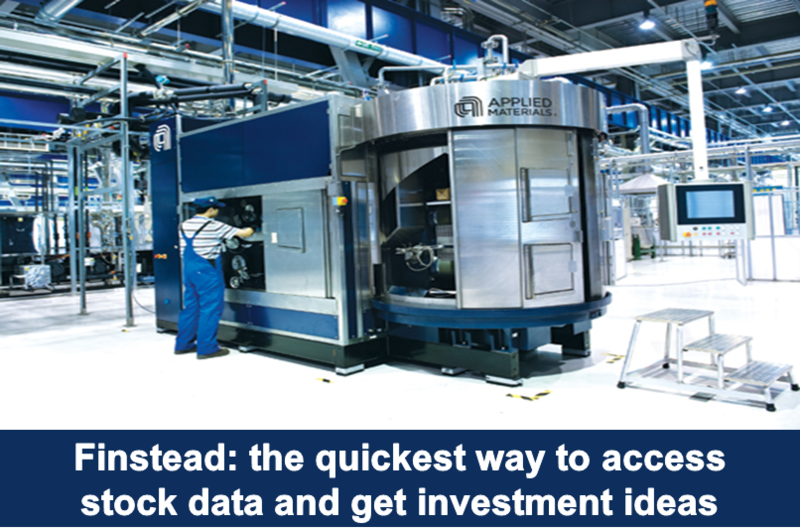 Microchip Technology (MCHP) is one of the highest-quality firms in the semiconductor space. It powers a variety of smart devices and the "Internet of Things" applications. Microchip products can be found under the hood of the latest cars with the most advanced electronics. The company is poised to profit from rising chip content per vehicle. Over the last month, Microchip Technology Incorporated (MCHP) returned +6.47%. Microchip Technology Incorporated (MCHP) average analyst price target ($100.82) is 5.73% above its current price ($95.36). For the latest price and information on Microchip Technology, please visit Finstead and ask for "Microchip" or "MCHP analysis". Applied Materials, Inc. (AMAT) shares are trading at $33.62, up 0.39%. The company is announcing its quarterly earnings results on Thursday after the market close. What's driving Applied Materials stock price? What's AMAT stock price forecast? Applied Materials supplies equipment, services, and software for the manufacturing of semiconductor chips that are used for electronics, PC and TV flat panel displays. The stock fell 38% in the past year and can be now purchased at an attractive P/E ratio of 8.64, significantly discounted compared to its industry peers. Investors are showing interest in the company because of the strong revenue growth and solid profits. On the other hand, few bearish investors worry about the slowdown of the chip and memory verticals. Last quarter’s revenue rose 20% to $4.47 billion and earnings per share came at $1.20 compared to $0.86 for the same period last year. Fourth-quarter results will be released after market close on November 15, 2018. Analysts expect the company to earn $0.97 per share on revenue of $4.0 billion. The company beat analyst estimates in the previous four quarters. Over the last month, Applied Materials, Inc. (AMAT) returned -9.33%. Applied Materials, Inc. (AMAT) forward P/E ratio is 8.64, and it’s low compared to its industry peers’ P/E ratios. Applied Materials, Inc. (AMAT) average analyst price target ($62.44) is 77.03% above its current price ($35.27). For the latest price and information on Applied Materials, Inc., please visit Finstead and search for "AMAT price" or "AMAT news". Applied Materials (AMAT) stock: expect a recovery? Applied Materials, Inc. (AMAT) shares are trading at 47.44, down 0.15%. The company is announcing its earnings on Thursday after market close. 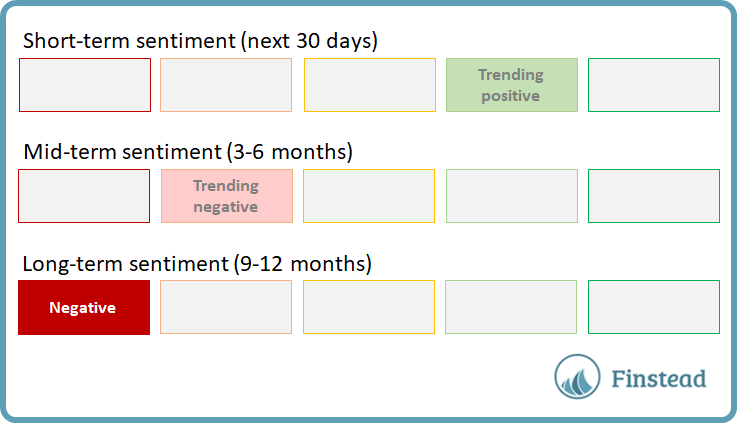 The stock has been in the bearish territory. Morgan Stanley downgraded Applied Materials from Overweight to Equal Weight and dropped the target to $54, which is still significantly above the current stock price. 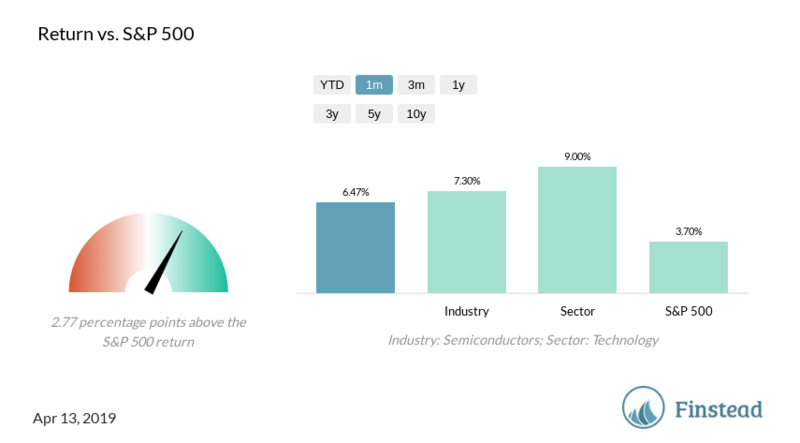 Applied Materials has been lagging semiconductor index funds (SOXX). Analysts are concerned about the company because of the oversupply of NAND and DRAM chips. However, the company beat earnings estimates in each of the past four quarters. 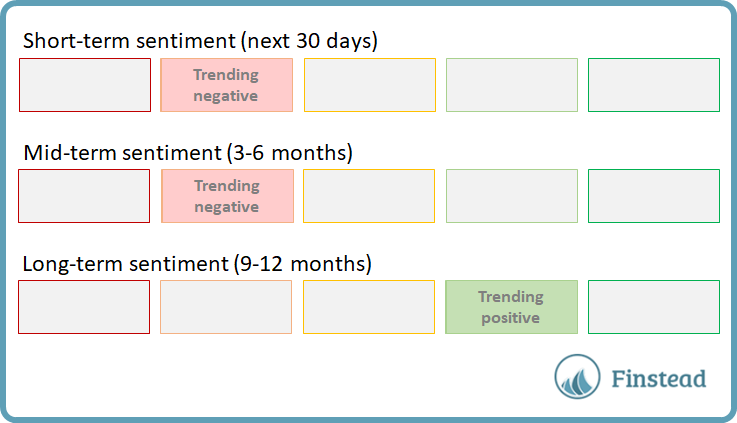 The long-term sentiment (9-12 months) is negative. 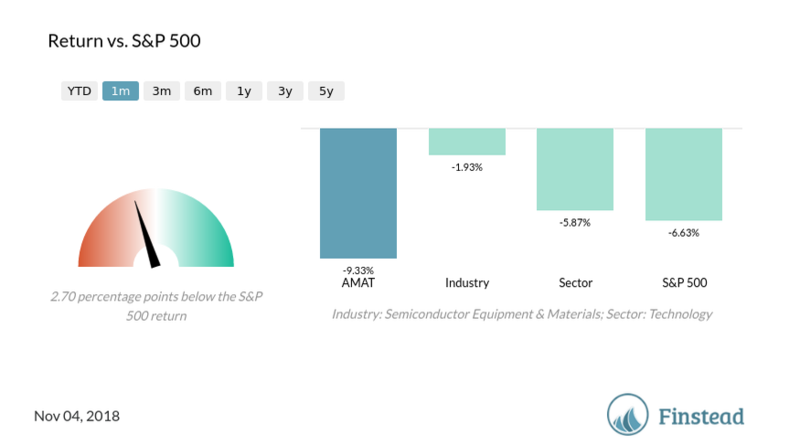 Over the last month, Applied Materials (AMAT) returned +2.97%. Applied Materials (AMAT) forward P/E ratio is 10.64, and it’s low compared to its industry peers’ P/E ratio. Applied Materials (AMAT) average analyst price target ($70.12) is 45.69% above its current price ($48.13). Are you looking for the analysis of Applied Materials, Inc. (AMAT) stock? Are you wondering what the bulls and the bears say about it? If so, you came to the right place. In this stock guide, we will share with you 13 reasons to buy and 9 reasons to sell AMAT stock. You’ll get a perspective on what the bulls and the bears say about it. Is AMAT a buy or a sell? Should I sell or hold AMAT stock today? Is AMAT a good buy / investment? What are AMAT analyst opinions, recommendations and ratings? 1. Applied Materials is the chip equipment industry's standard bearer. The firm has the broadest product portfolio and offers customers the closest thing to a one-stop shop. 2. Applied has been streamlining operations to lower its cost structure and has reinvested some of the savings in R&D in recent quarters. 3. Applied has benefited from the rising popularity of flat-panel displays, which share manufacturing technologies with those used in semiconductor fabrication. As these displays have become more complex in recent years, demand for Applied's relevant tools has risen. 4. 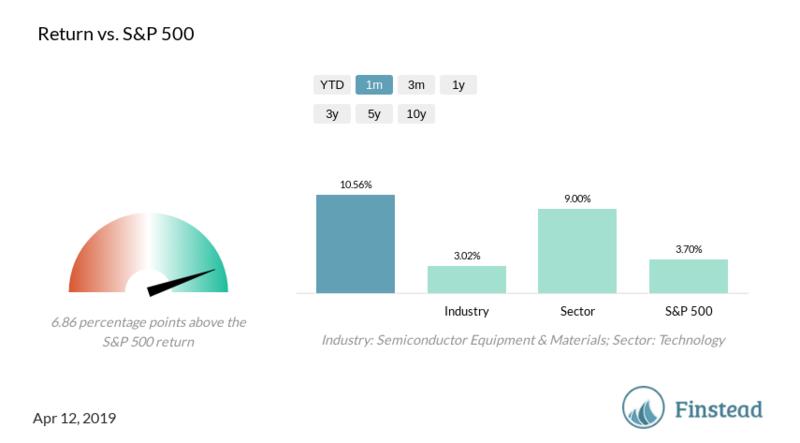 Applied Materials is a global leader in semiconductor equipment sales. The company is the number one equipment supplier to the global semiconductor industry. AMAT has been the industry leader for over twenty years, and is strongly positioned in the industry. 5. The company’s semiconductor business has done well last year, with important design wins in the CVD and PVD tools that are boosting revenues and market share. In fact, the company’s leadership businesses comprising Epi, PVD, Implant, CMP and RTP, boast high market share and unique capabilities. The company is quite optimistic as these businesses deliver important technology that will enable customers to drive major innovations in transistor and interconnect for 10-nanometer (nm) devices. 6. The company has been gaining considerable success in expanding beyond semiconductors. The company is in a very good position to take advantage of the transition from LCD to OLED technology. Rapid growth in large-format TVs has opened up opportunities to invest in new Gen 10.5 capacity and Applied Materials is currently tracking seven Gen 10.5 projects. 7. Market dynamics appear to be improving. Being an equipment company offering products for front-end applications, Applied is dependent on wafer starts at new and existing semiconductor facilities. Therefore, in an up cycle, the company would be able to sell its superior quality products and maybe pick up some market share. 8. Even though the current global economic risks prevail, spending in China is expected to increase. The company remains strongly positioned in China where it continues to see strong growth in semiconductor and display. Growing investments from Chinese domestic manufacturers have been the main catalysts. 9. AMAT forward dividend yield is 2.18%, higher than the industry (0.42%) and sector (0.23%) forward dividend yields. See AMAT forward dividend chart. 10. 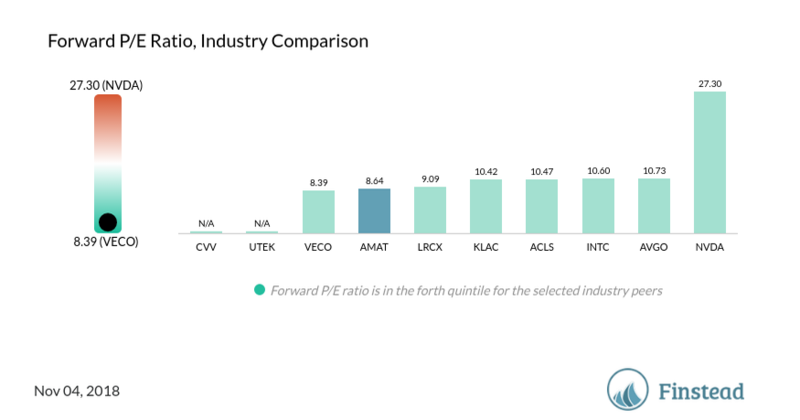 AMAT forward P/E ratio is 10.94, and it’s low compared to its industry peers’ P/E ratios. See AMAT forward P/E ratio chart. 11. 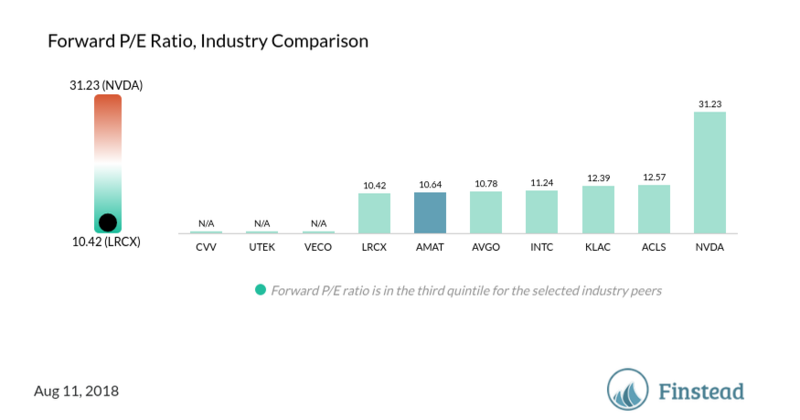 AMAT PEG ratio (P/E adjusted for growth) is 1.25, and it’s low compared to its industry peers’ PEG ratios. See AMAT PEG chart. 12. AMAT average analyst rating is Buy. See AMAT analyst rating chart. 13. AMAT average analyst price target ($48.41) is above its current price ($42.47). See AMAT price target chart. 1. To maintain its market share, Applied must compete successfully in various segments with numerous firms that only specialize in their submarkets. Therefore, Applied may not have the best-of-breed product in every segment in which it competes. 2. 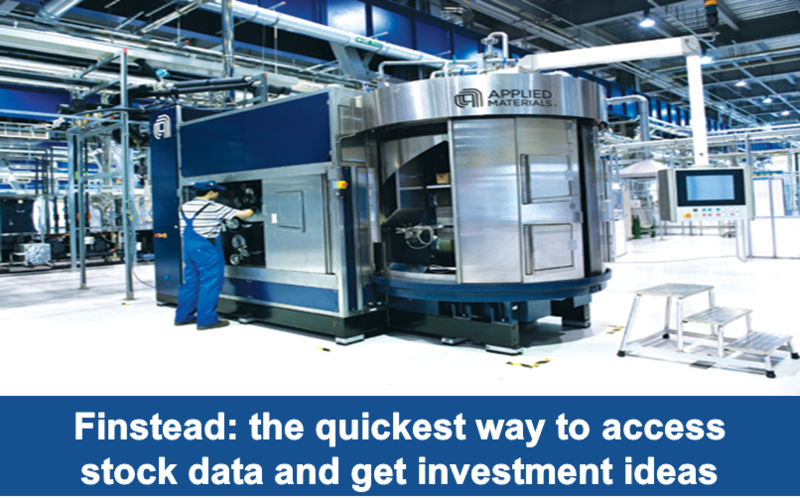 Applied is exposed to the cyclical semiconductor industry, which means that its financial results can fluctuate considerably. 3. The chip equipment business is challenging, and Applied has not always been successful when entering new segments. 4. Capital equipment sales are typically high-value and AMAT is dependent on a relatively few high-value product sales to a limited customer base. Therefore, winning each individual order is very important. Moreover, the company also has to adopt an extremely customer-centric approach, maintaining very good relations with each individual customer. 5. The company has a high fixed cost structure. Therefore, margins suffer a lot when sales fall. On the other hand, the structure is necessary to support an increase in demand. 6. Growth depends and will continue to depend on the company’s ability to innovate. Applied Materials is vulnerable to intense competition and changing technology, commercialization methods, industry standards and seller and buyer needs. These call for frequent changes in product and service offerings, which in turn require heavy investments, putting pressure on its earning capacity. 7. AMAT stock price ($42.47) is close to the 52-week high ($43.04). Perhaps now is a good time to sell? See AMAT price chart. 8. AMAT quarterly revenue growth was -10.70%, lower than the industry and sector average revenue growth (7.53% and 5.21%, respectively). See AMAT revenue growth chart. 9. AMAT profitability is declining. The YoY profit margin change was -4.42pp. See AMAT profitability chart. What are your thoughts on AMAT?